Popular peer-to-peer service BitTorrent has launched BitTorrent Sync for iOS, an app that allows users to sync and backup an unlimited number of files across their devices as well as the ability to share files with other devices. 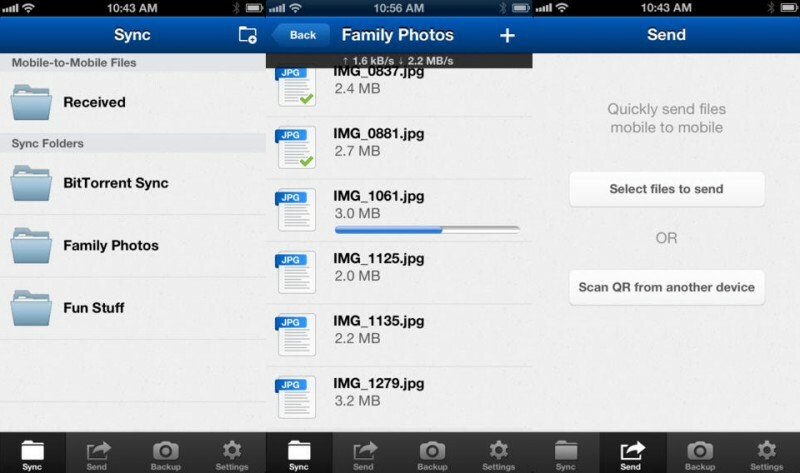 The app allows for syncing of photos and videos with Camera Roll backup integration, and also offers encrypted file transfers and QR code support for peer transfers. BitTorrent Sync is a brand new product from BitTorrent that lets you sync an unlimited number of files and folders of any size across all of your trusted devices. BitTorrent Sync for iOS gives you access to all of your synced folders when you’re on the go, and introduces a new mobile-to-mobile sharing feature for easily sending your photos and videos to your friends. Prior to its release on iOS, the app started as an Android-only project released in beta last month. BitTorrent Sync can be downloaded from the App Store for free.